Updated on May 24, 2017, to include pricing. $86,090 for the world’s fastest production car. where the front wheels are lifted at launch. By now, you have heard that the 2018 Dodge Challenger SRT Demon is the fastest production car ever built. That means it outperforms the McLaren 570S, the Bugatti Veyron Super Sport Worldwide, and even the Tesla Model S when the electric sedan operates in Ludicrous mode. Certainly, if the Challenger SRT Hellcat wowed you, then the SRT Demon introduced at the 2017 New York International Auto Show is certain to leave you spellbound. 1 — Purchase a 2018 SRT Demon and you’ll receive one full-day session at the Bob Bondurant School of High-Performance Driving. Notably, the class is free — you’ll want to participate if race car driving is unfamiliar to you. 2.3 — How fast does the new Dodge go? How about a 0-60 mph time of just 2.3 seconds? That’s faster than any production car on the market, including exotics costing millions of dollars. And on your way to greater speeds, you’ll hit 30 mph in exactly one second. 2.92 — The amount of feet the front wheels lift off the ground at launch. 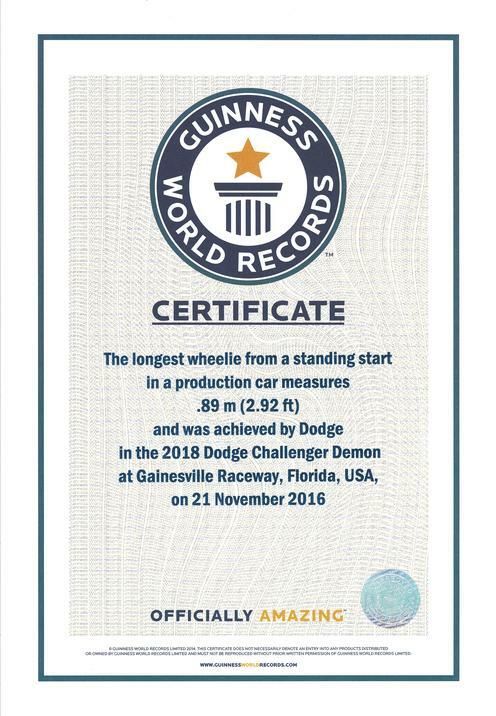 The number in itself (certified by the Guinness Book of World Records) is impressive, but what is most amazing is that this is the world’s first production car to offer that feature. No, it doesn’t automatically lift at all times — only when you engage launch control. And here is another number you should allow to sink in: 1.8 — as in the g-force, the highest ever recorded at launch in a production car. 9.65 — Once you hit 60 mph and keep going, you’ll want to test the quarter-mile performance for this beast. 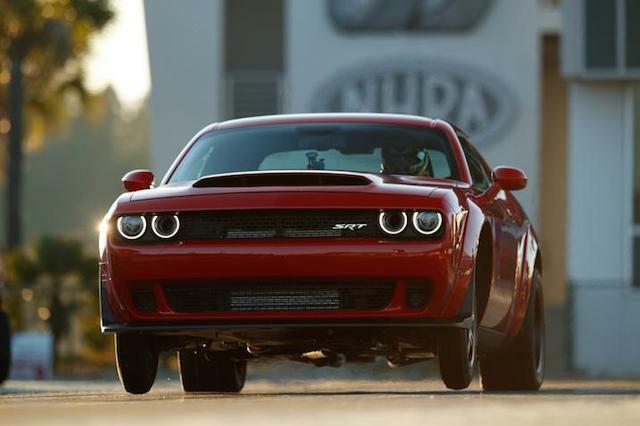 You’ll hit that in just 9.65 seconds at 140 mph as certified by the National Hot Road Association (NHRA). 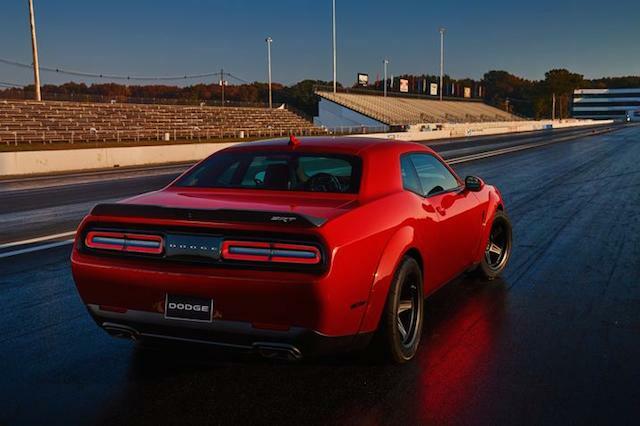 Once again, the SRT Demon holds another record: the fastest quarter-mile time of any production vehicle. 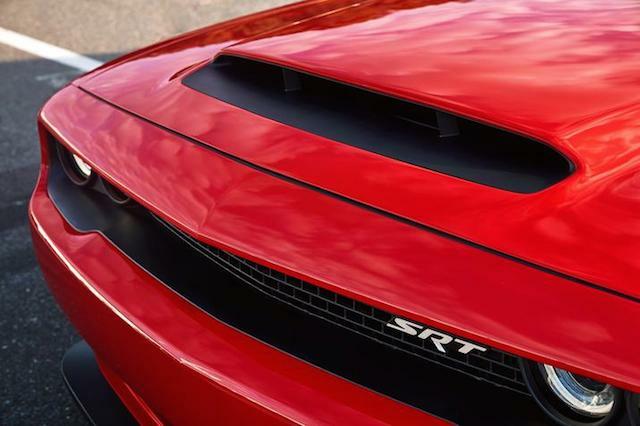 45.2 — You can’t miss the functional air scoop centered on the hood of the SRT Demon. It measures a whopping 45.2 square inches, the largest of any production car. Air is a key ingredient in performance and Dodge makes certain this hyper coupe gets what it needs. 100 — Premium grade, anyone? Although the SRT Demon runs fine on 91 octane, the hot coupe also takes 100+ octane for optimum performance. Your local speedway has it on tap as do some service stations, including certain Sunoco outlets. Keep in mind that the SRT Demon takes high-octane unleaded fuel, not leaded. 232 — The SRT Demon weighs at least 200 pounds less than it could have in part by subtracting unnecessary equipment. Removing the front passenger seat and the back seat saved 58 and 55 pounds, respectively. Other weight savings came by deleting the 16-speaker audio system, removing the trunk deck cover trim, carpeting, and spare tire cover. Substituting parts for lighter materials, including sway bars, brake calipers and rotors, and even switching to a manual tilt and telescopic steering column brought additional weight savings. In all, the weight savings were at least 232 pounds. 500 — The SRT Demon comes with a pair of key fobs. Key fob no. 1 is black and limits engine horsepower to a more pedestrian 500 horsepower. To achieve full power, you’ll need the key fob no. 2 (red), what enables this beast to reach its full potential of 808 horsepower and 717 pound-feet of torque. You’ll reach those numbers by fueling with 91 octane. 840 and 770 — These two are the most important numbers to race car enthusiasts, representing horsepower and torque, respectively. However, you’ll only reach peak power by opting for the available Direct Connection powertrain controller. The SRT Demon utilizes the same supercharged 6.2-liter V8 engine found in the SRT Hellcat, but there are some important distinctions. 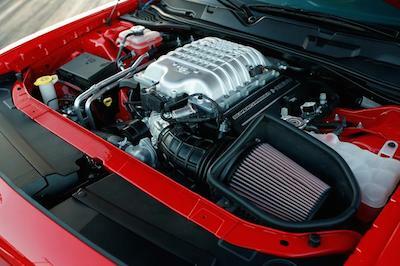 Modifications include a 2.7-liter per rev supercharger with increased boost to 14.5 psi. You’ll also find a higher rpm limit of 6,500 and the first-ever production car with a liquid-to-air intercooler chiller system. Also present is an after-run chiller that keeps cooling the supercharger and the charge air cooler when the engine is off. 3,300 — The 2018 SRT Demon will be available in two markets: the United States and Canada. For its first year of production, just 3,300 copies can be had. Of these, Americans will have access to 3,000 units and Canadians to 300 copies, roughly in line with the 10-to-1 population ratio of these two North American markets. 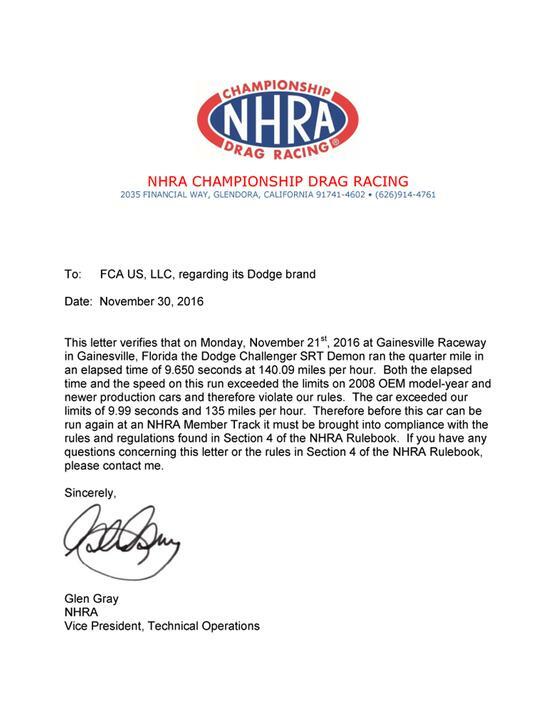 86,090 — Six weeks after announcing the SRT Demon, Fiat Chrysler supplied pricing information. To our surprise, it will cost considerably below our estimated $100,000 figure, costing customers $86,090, including $1,700 for the gas guzzler tax and another $1,095 for destination. Interestingly, Dodge is charging just $1 extra for the Demon Crate option, what unleashes the full 840 horsepower this model achieves when running on racing fuel. Otherwise, you’ll have to settle for “only” 808 horsepower. Other $1 options include a front passenger seat, rear seat, and trunk carpeting. But these options add weight and will keep the SRT Demon from reaching its full performance potential. 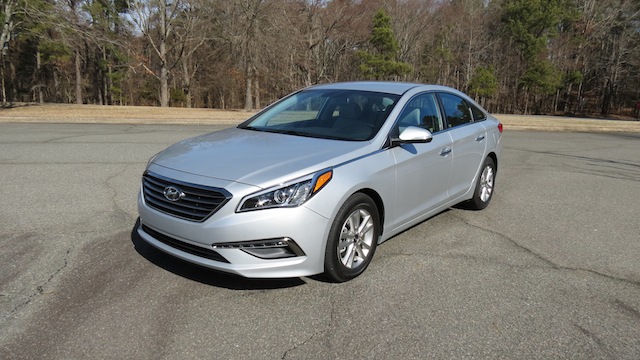 This also means not opting for the power sunroof, what adds weight and $4,995 to your cost. As for dealer markups, we expect they’ll be substantial and drive the final cost well above $100,000. So, our earlier estimate really isn’t out of line. You can learn about other upgrades here. Hard numbers are one thing, but they’re only part of the story. Indeed, when you drill down on the information supplied by Dodge and gleaned by others, you’ll discover some important facts about this super coupe. For one, the Bilstein Adaptive Damping shocks are drag racing tuned, effectively shifting as much weight as possible to the rear axle to maximize traction. Dodge says this feature increases rear tire grip by 11 percent. To further enhance weight shift to the rear wheels, Dodge “softened” select suspension components, including the springs and sway bars. 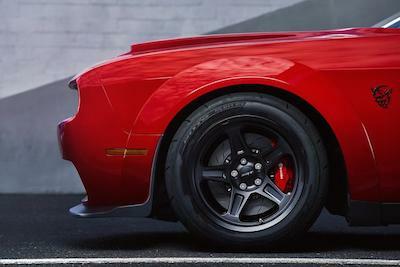 Compared with the SRT Hellcat, the softer springs are 35 percent lighter up front and 28 percent lighter in the rear. Further, the sway bars are 75 percent lower upfront and 44 percent lower in the rear. 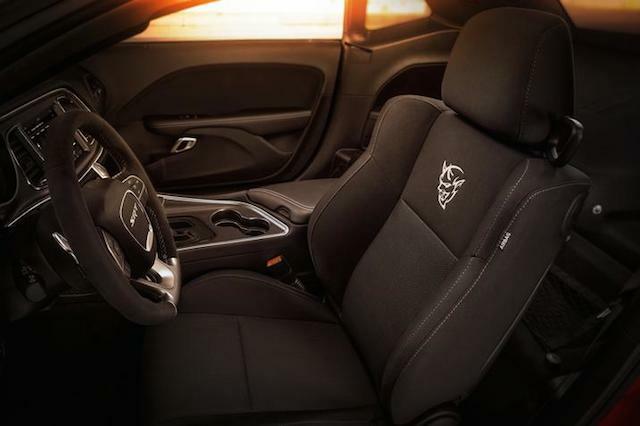 Lastly, Dodge will also make a “Demon Crate” available, carrying such exclusive components as Direct Connection Performance Parts. The crate includes the all-important performance powertrain control module, what allows the SRT Demon to take high octane. You’ll also find a conical performance air filter, fender cover, tool bag, and other parts, representing the ultimate package for this stunning super coupe. All photos copyright Fiat Chrysler Automobiles. All rights reserved. When closing a deal on a new or used car, paperwork and other documentation must be submitted and completed before the deal is finalized. And the last thing you want is to make a trip to the dealer only to discover you’re short one or more documents. The following list is composed of those items you may need in your possession as you seal the deal. 1. A valid driver’s license. You carry your driver’s license with you, but is it still valid? Pull out your driver’s license before you head to the dealer to verify that it hasn’t expired. If it has, then you won’t be driving your new ride home until it has been renewed! 2. Your trade-in’s title. 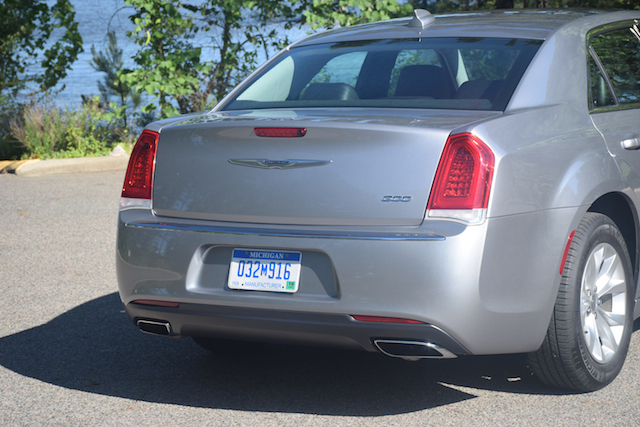 If you’re trading in your vehicle for another one, you need to hold its title. The title is clear for transfer if you own the car outright. Otherwise, if there is a co-signer listed or a lien on the vehicle, you’ll need to settle with this person first. Be careful here — if you make a mistake, you’ll have to touch base with the Department of Motor Vehicle to make a correction, a time consuming task. You might also contact your dealer ahead of time to find out how best to handle the title. 3. Your trade-in’s registration. A title is one thing, but your vehicle also must have a valid registration. Typically, that document can be found in your glove box along with the vehicle’s inspection and insurance information. While you’re at it, verify that the tags affixed to the license plate are current. 4. Current insurance coverage. What you don’t want to do is to drive off the dealer’s lot without insurance. Typically, insurance is required if you borrow money to buy a car. Your lender will insist on coverage and certain inclusions at that. If you pay cash for a car or insurance is not a required purchase consideration, then you’re liable once you get behind the wheel of the car. Contact your insurer and arrange for coverage to commence the moment the deal is finalized. 5. Approved loan documentation. Unless the dealer is working out the loan details on your behalf, you need to do so at your end. Visit your bank or credit union to obtain loan information. At the same time, you can find a car loan elsewhere. Apply for a car loan and once approved, bring your loan documentation with you. If you’re obtaining financing through the dealer, then you’ll need to provide proof of income. Your dealer may also ask for your approval to obtain credit information and may contact your employer to verify employment information. 6. An extra set of keys. Car keys and fobs are not paperwork nor documentation! But if you are trading in a car, the dealer will request all keys be relinquished. How odd it may seem if you have only one key or fob to turn in? 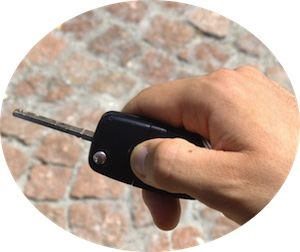 Key fobs especially are expensive to replace and the dealer may subtract $200 or more from your trade-in price if you have only one key fob available. 7. Cash on hand. Yes, money also does not count as paperwork or documentation. What it does do is cover those costs not part of your loan package. In fact, it is simply better to pay for tags or other miscellaneous fees separately, instead of rolling those costs into your car loan. Furthermore, if you have down payment funds to supply, then you’ll need cash too. Better yet, leave the money in your checking account and supply a debit card as this works same as cash and offers an automatic receipt. If your deal involves a trade-in, make sure your personal items are removed from the car before you relinquish same. To sum up, the better organized you are, the shorter your time at the dealership. Unless, of course, you enjoy sitting in waiting rooms watching daytime television drama while your spouse drives home to retrieve the extra keys, the loan documentation, or other paperwork.